Born in a family of scholars and exposed to the principles of theosophy due to her father's association with the theosophical movement and its leaders like Annie Besant and others, Rukmini Devi grew up with a sense of freedom of thought and expression. In her teens her friendship with George Arundale, an associate of Besant, culminated in their marriage, which in turn earned her the friendship of great artists and scholars, one among them being Anna Pavlova, the world renowned Ballerina. 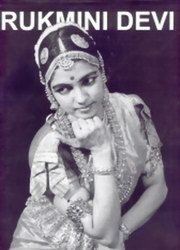 Her attraction to the classical western dance slowly veered her interest towards Bharatanatya, the classical dance of South India, which she mastered even after starting to learn it in her early thirties. This led her to establishing the Kalakshetra at Chennai, the internationally acclaimed school of dance, music and allied arts. Many stalwarts in these artistic fields came to help her nurture this institution. This institution also endeavoured to inculcate the traditional values in its wards. Rukmini Devi and Bharatanatya is all about her childhood, her marriage to Arundale, her life as a dancer, the founding of Kalakshetra, her pioneering work in the field of art as well as for the welfare of animals. Her association with and the recognition she won from internationally famous artists, scholars and world leaders are revealed through text and photographs in this book.